The Sixties, where a bitter rival between manufacturers helped elevate the two races to international prestige. Failing in its attempt to buy out Ferrari in the early 1960s, the Ford Motor Company decided to go all-out to defeat the Italian automaker on the race track. While Ford's main focus was the 24 Hours of Le Mans, two Florida race tracks would play a key role in this new rivalry. Modern American sports car racing actually dates back to 1948, when World War II veteran Cameron Argetsinger decided to host a European-style grand prix on public roads around his adopted home of Watkins Glen, N.Y. The event was very successful, and other venues soon followed suit. After watching the 24 Hours of Le Mans, Alec Ulmann decided to build an event to rival the French classic, using Hendricks Field, an abandoned WWII B-17 training base outside Sebring, Fla. He started with a three-hour race in 1950, and extended it to 12 hours in 1952. The following year, it was part of the FIA World Manufacturers Championship, which would continue through 1972, with crowds packing the facility to enjoy both the racing and Florida's mild winter weather. Meanwhile, William H.G. France founded NASCAR in 1948 to sanction American stock car racing, including the events he held annually on a beach-and-road circuit in Daytona Beach, Fla. "Big Bill" also enjoyed sports cars, promoting races at a nearby airport in New Smyrna Beach. France built Daytona International Speedway in 1959, taking the novel step of incorporating an infield road circuit inside the massive high-banked 2.5-mile trioval. After holding club races at the speedway beginning in 1962, France held his first international event, the Daytona Continental, in 1962, as a prelude to the Daytona 500 while running one month ahead of the Sebring event. Dan Gurney took the checkered flag for the first Daytona Continental, literally rolling to victory after he lost the engine in his Lotus-Climax 19B and stopped just shy of the finish line with a minute remaining. Gurney would go on to play a major role in developments throughout the Sixties – and then would return as a successful car owner in the late 1980s. With Ford and Ferrari ready to go to war, the stage was set to extend the battleground to the two Florida venues. After two successful three-hour races, France extended the Daytona Continental to 2,000 kilometers in 1964 – approximately 30 minutes longer than the Sebring classic. Ferrari drew first blood in the battle by scoring podium sweeps at Daytona, Sebring and Le Mans in 1964. Dan Gurney took fourth at both Daytona and Le Mans to lead the blue oval. Ford was racing the new Daytona Coupe fielded by Carroll Shelby, but was also hard at work developing prototype race cars designed only for racing. For 1965, Ford had a new weapon, the sleek GT40, and let Ferrari know it meant business with a top-four sweep at Daytona. Ken Miles and Lloyd Ruby led the Ford charge, with the top Ferrari coming home seventh. The Ferrari factory opted not to compete at Sebring, where a Chevrolet-powered Chaparral 2 driven by owner Jim Hall and Hap Sharp won over a GT40. The stage was set for a Ford vs. Ferrari showdown at Le Mans, where Ferrari dominated with a podium sweep while Ford's new Mk IIs and GT40s failed to finish. After falling flat, Ford would spare no expense for 1966. Sensing the opportunity, France extended the Continental to 24 hours, with the race also serving as the opening round of the FIA World Manufacturer's championship. Miles and Ruby repeated as Daytona winners, leading a podium sweep with the Mk II version of the GT40. The top Ferrari was a 365 driven by Mario Andretti and Pedro Rodriguez. Miles and Ruby carried over by leading another podium sweep at Sebring. It was on to Le Mans, where Ford staged a "photo finish" in another podium sweep. Up through 1966, Ferrari's efforts at Daytona were led by Luigi Chinetti's North American Racing Team. But for 1967, the Italian manufacturer fielded a pair of factory-entered 333P4s – and dominated the race. To embarrass Ford in its home country, Ferrari staged its own "photo finish" of the top-three sweep. Taking no chances, Ferrari then opted to sit out the Sebring event, where Mario Andretti and Bruce McLaren won in a new Ford Mk IV over the Mk II of A.J. Foyt and Ruby. The climax of the Ford vs. Ferrari was at Le Mans in 1967, where a pair of American drivers teamed to win in a Shelby-prepared Mk IV. Formula One veteran and 1962 Daytona Continental winner Dan Gurney teamed with Foyt, then a two-time Indianapolis 500 winner and four-time USAC Indy car champ. A mid-1967 rules change by the FIA that limited engine displacement made the powerful Fords and Ferraris obsolete, effectively ending the vaunted rivalry. But the rules change opened the door for Porsche. Entering five long-tailed 907s for the race, Porsche scored a podium sweep at Daytona (with another staged photo finish). Jo Siffert and Hans Herrmann – who were among the five drivers to share the winning car at Daytona – led a one-two finish at Sebring, where Porsche won overall for the first time since Herrmann and Olivier Gendebien shared an RS60 in 1960. The decade closed with a wild race at Daytona, where the factory Porsches fell out one by one due to the failure of an eight dollar part in the drive shaft. Mark Donohue and Chuck Parsons went on to win in a Chevrolet-powered Lola fielded by Roger Penske. At Sebring, Jacky Ickx and Jackie Oliver won in an "old style" Ford GT40 prepared by John Wyer. 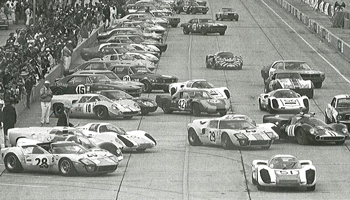 Helped by the Ford vs. Ferrari rivalry at Le Mans, Daytona joined Sebring to share the international stage with the French classic. Both races would continue to grow through the 1970s, despite international rule changes and a domestic fuel shortage that threatened American motorsports.